Jonathan Ball patented a method to line riveted wrought-iron pipes with hydraulic cement in 1843. He formed a company in New York City to manufacture the pipes and sold rights to other territories. In 1854, Ball sold most of the patent rights to the new Patent Water & Gas Pipe Company of Jersey City, New Jersey, but kept the rights to serve Ohio, Kentucky, and Indiana for himself. 1843 U.S. Patent 3,375, Coating Water Pipes, December 15, 1843, Jonathan Ball, of New York, New York. Re-issued RE496 on September 15, 1857. 1848 Report of the Water Commissioners on the Material Best Adapted for Distribution Water Pipes: And on the Most Economical Mode of Introducing Water in Private Houses, August 14, 1848. Document No. 32. Page 7: Pipes formed of sheet iron, coated internally with hydraulic cement, have been recently introduced, and they promise to be highly useful under certain circumstances. When laid in the earth, and in situations exposing them externally to moisture, they are protected by a covering of hydraulic cement, which besides preserving the iron against rust, gives an additional strength to the pipe. . Whether they can be economically used for the distribution of water from the mains, has not been fully determined by any experiment within our knowledge. 1850 New York City Directory for 1850-1851. Page 5: Patent Indestructible Water Pipes, by J. 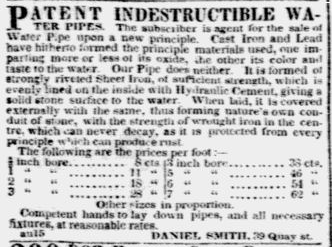 Ball & Co.
1853 "Indestructible Water Pipes," The Times-Picayune (New Orleans, Louisiana), September 24, 1851, Page 4. Chas S. Bier & Co. having got the patent right for the Southern States to manufacture J. Ball & Co's Indestructible Water Pipes announce they have opened an establishment for the manufactur of the same at New Orleans. Patent Water and Gas Pipe Co.- Jersey City. This Company was formed March 2, 1854, under the General Manufacturing Law of New Jersey, with a capital of $250,000. They are now erecting three buildings and machinery for the manufacture of Ball's Indestructible Pipes, adjoining the Hudson River Cement Co.'s Works, Jersey. They are now prepared to receive orders to furnish and lay the above-named pipes, with a sufficient guaranty of their superiority in every respect over any other Pipes now in use for the distribution of water. Joseph Battin, President. 1857 "On the Petition of Jonathan Ball, of Elmira, New York, praying for an extension of a patent granted to him on the 15th day of December 15, 1843," Evening Star (Washington, DC), September 18, 1857, Page 2. 1857 The Patent Water & Gas Pipe Company, of Jersey City N.J.
1860 Jonathan Ball's proposal to the City of Indianapolis was delivered to the City Council on April 7, 1860 and was reprinted in a local newspaper in 1865 (see October 6, 1865, reference below). 1860 US Patent No. 28,184, Cement Pipe Machinery, May 8, 1860, Henry Knight, of Jersey City, New Jersey. Reissued No. 1,277, February 15, 1862. 1861 US Patent No. 32,298, Manufacture of hydraulic-cement pipes, May 14, 1861, Henry Knight, of Jersey City, New Jersey. 1861 US Patent No. 33,152, Improvement in combination cement and metal pipes, August 8, 1861, Henry Knight, of Jersey City, New Jersey. 1864 U.S. Patent No. 34,890, Improvement in molds for cement pipes, April 8, 1862, Henry Knight, of Jersey City, New Jersey. 1864 "The Committee on Patents and the Patent Office, to whom were referred the petitions of Daniel Fitzgerald and Jonathan Ball, having considered the same, beg leave to report." April 20, 1864, ordered to be printed. 38th Congress, 1st Session, Rep. Com. No. 52. 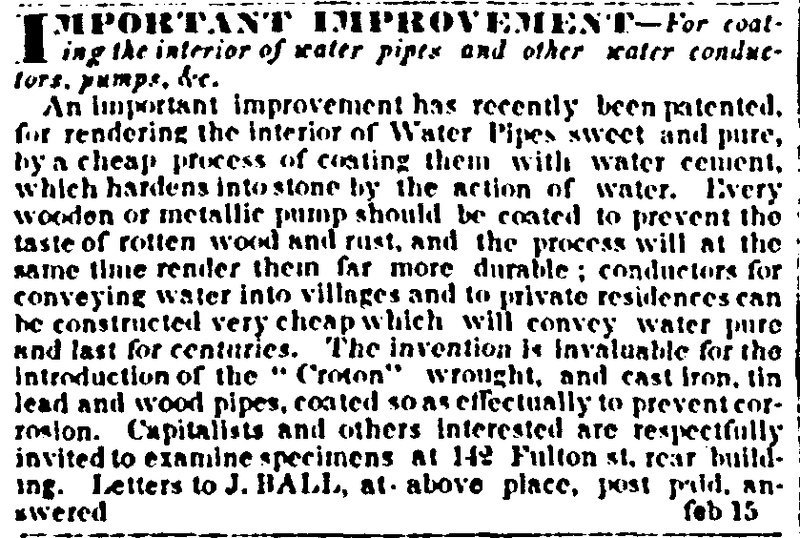 1865 "Drain, Sewer and Water Pipe," Newark Daily Advertiser, April 4, 1865, Page 1. Advertisement by Crawford, Phelps & Ferris. Messrs. Editors: A copy of the following letter, addressed to Eric Locke, late Councilman, by Mr. Ball, of Elmira, New York, came into my possession in 1865, Mr. Wood, our City Engineer, having obtained it and furnished it to a Committee of Council, of which I was Chairman. As the question of water works is now again being agitated, I have thought the publication of the plan and estimates of a practical hydraulic engineer and constructor, made six years ago, after a view of the whole ground, might be of interest to your city readers, and, therefore, send it to you for that purpose. Austin H. Brown. Includes March 23, 1865 letter from J. Ball to James Wood, Esq. and J. Ball's 1860 water works proposal. 1866 "The Committee on Patents, to whom was referred the petition of Jonathan Ball for the extension of his patent "for lining metallic pipe with hydraulic cement, report." May 2, 1866, ordered to be printed. 39 Congress, 1st Session, Report No. 61. 1866 "The Water-Pipe Patent," The New York Times, June 16, 1866, Page 1. The extension of the twenty-one years' water-pipe patent of Jonathan Ball, the public will be glad to know, has been filled in the House through the exertions of Mr. Dawes, of Massachusetts. Page 28: Patent Water and Gas-Pipe Co. Green Street, Corner of Bay, Jersey City, N. J. Officers: 1864: President - W. H. Talcott; Vice-President Nathan Stephens; Sec'y and Treas'r - Walter Harris; Sup't and Engineer - McRee Swift. Directors: W. H. Talcott, Justus Slater, Jersey City; McRee Swift, of New Brunswick; Nahtan Stephens, William Beard, Brooklyn; Joseph Battin, Nathan Hedges, Newark, N.J. Page 94: Crawford & Ferris, Manufacturers of Patent Protected Wrought Iron Water Pipe, and Patent Hydraulic Cement Sewer and Drain Pipe. Office, cor S Eighth and Provost street, J C; Factories, cor Bay and Provost, J C, and State and Bishop Streets, New Haven, Conn.
1867 US Patent No. 64,187, Improvement machine for making water, gas, and other pipes, April 30, 1867, George H. Bailey, of Jersey City, Hudson County, State of New Jersey. 1867 "Portland Water Company," Sacramento Daily Union, October 18, 1867, Page 3. The Portland [Maine] Water Company, organized last spring with $600,000 capital, and General George F. Shepley as President, will commence immediately the construction of works to bring the water to the city from Lake Sebago, and will probably have them completed and in operation next year. The American Water and Gas Pipe Company of Jersey City, New Jersey, will manufacture all of the pipe requisite, establishing a permanent branch in Portland for the purpose. 1868 "The Cement Pipe," Star Tribune (Minneapolis, Minnesota), May 9, 1868, Page 4. Includes a list of several installations. Why it was purchased. Detailed Statement by W. H. Lee. 1870 U.S. Patent 99,402, Improvement in machine for forming sheet-metal tubing, February 1, 1870, Mortimer M. Camp, of New Haven, Connecticut, assignor to himself, D. Goffe Phipps, and E. I. Foote, of same place. 1870 U.S. Patent 104,348, Improved Joint for Cement Pipes, June 14, 1870, D. Goffe Phipps, of New Haven, Connecticut. 1870 The American Water and Gas Pipe Co., Jersey City, N.J., manufacturers of Knight-Bailey's Patent Wrought Iron & Cement Protected Water-Pipe. Contractors for the Water Supply and Drainage of Cities and Villages. 1874 The American Water and Gas Pipe Company, manufacturers of Knight-Bailey's Patent Wrought Iron and Cement Protected Water Pipe, and Contractors for the Water Supply ad Drainage of Cities and Villages, Northwest Corner of Greene and Bay Streets, Jersey City, N.J.
Directors. John R. Halladay, Garwood Ferris, William Keeney, James Crawford, Stephen Morgan, Job Falkenburgh, John E. Halladay. Officers. John R. Halladay, President. Garwood Ferris, Secretary and Treasurer. 1875 The Patent Water & Gas Pipe Company, of Jersey City N.J.
Officers: McRee Swift, President; Nathan Stephens, Vice President; Rush Neer, Secretary and Treasurer; McRee Swift, Engineer and Superintendent. 1876 "Mr. Ball's Report," by Phineas Ball, January 15, 1876, from Report of the Board of Water Commissioners of the City of Springfield. Pages 23-29: Of Wrought-Iron and Cement-Lined Pipe in General. Page 26: The original patent for this kind of pipe was granted to Jonathan Ball of New York City, dated December 15, 1843. The claims in the original patent are as follows, to-wit: "What I claim as my invention is the application of hydraulic cement or water cement as a coating upon the interior surface of metallic water pipes to prevent the corrosion and oxidation of the metals or* which the pipes are composed." "Also the means by which it is accomplished, as set forth." The original patent was re-issued September 15, 1857. In this re-issue the word "cement" is used fourteen times, "hydraulic cement" four times and " Roman cement" once; while the word "sand" does not occur, and there is no reference whatever to its use in connection with cement by any form of expression or phraseology used in the document. In practice, however, singularly enough, from the earliest application of the device, the cement was always used mixed with sand in the same manner as in mason work. The earliest recorded line of pipe laid under this patent is one mentioned in the circular of the Patent Water and Gas Pipe Company, under the date of 1875, by whom it was introduced, as being laid in Jersey City in 1845, and referred to in a certificate of Samuel McElery, as having been examined by him March 20, 1867. The next oldest line mentioned was laid at Saratoga in 1847, since which time the pipe has been laid in many cities and towns. 1876 Jersey Journal, March 30, 1876, Page 3. Notice of meeting of the stockholders of the "Patent Water and Gas Pipe Company, called for the purpose of reducing the capital stock of said company from $100,000 to $50,000. (signed) McRee Swift, President; Rush Neer, Secretary; Joseph Battin; Nathan Stephens; George H. Norman. 1876 Jersey Journal, April 26, 1876, Page 3. Certificate of Proceedings showing reduction of capital stock of "The Patent Water ans Gas Pipe Company" from one hundred thousand dollars to fifty thousand dollars. 1877 A practical treatise on water-supply engineering relating to the hydrology, hydrodynamics, and practical construction of water-works, in North America. With numerous tables and illustrations, by John Thomas Fanning. Pages 479-488: Wrought-iron Pipes. Cement-lined and Coated Pipes. 1883 "Henry Knight," The Brooklyn Daily Eagle, September 14, 1883, Page 4. Ferris & Halladay, Contracting Engineers & Builders of Water-works and manufacturers of Imperishable Water Pipe. Garwood Ferris, John E. Halladay. Office, 98 Hudson St., Jersey City, N.J.
1888 U.S. Patent 383,413, Joint for Cement-Lined Pipes, May 22, 1888, Edward H. Phipps, of New Haven, Connecticut. 1889 U.S. Patent 395,584, Conduit for electric wires or cables, January 1, 1889, Edward H. Phipps, of New Haven, Connecticut. 1889 Gopsill's Jersey City, Hoboken, West Hoboken, Union Hill, and Weehawken Directory, 1889-90. Ferris & Halladay, 98 Hudson. 1882 U.S. Patent 474,779, Bell-and-Spigot Joint for Cement-Lined Pipes, May 10, 1892, Edward H. Phipps, of New Haven, assignor to the Connecticut Pipe Manufacturing Company, of West Haven, Connecticut. 1889 Gopsill's Jersey City, Hoboken, West Hoboken, Union Hill and Weehawken Directory, 1889-90. Page 40: American Water & Gas Pipe Co. office 98 Hudson and factory Johnson ave n Pine. Page 190: Ferris & Halladay (Garwood Ferris and John E. Halliday), mnfrs of water pipes and contractors for water works, 98 Hudson. 1896 National Conduit Manufacturing Co. v. Connecticut Pipe Manufacturing Co., 73 Fed. Rep. 491, April 1, 1896, Circuit Court, District of Connecticut. 1896 "The Conduit Company Wins," The New York Times, April 2, 1896, Page 1. 1898 Talcott H. Russell, Receiver, vs. John F. Easterbrook, 71 Conn. 50, July 26, 1898, Supreme Court of the State of Connecticut. Involves stock of the Connecticut Pipe Manufacturing Company, which was in receivership. 1899 Charles Ward et al. v. Connecticut Pipe Manufacturing Company. Davies & Thomas Company, Claimant, 71 Conn. 345, January 4, 1899, Connecticut Supreme Court of Errors. Page 294: Water Pipes. 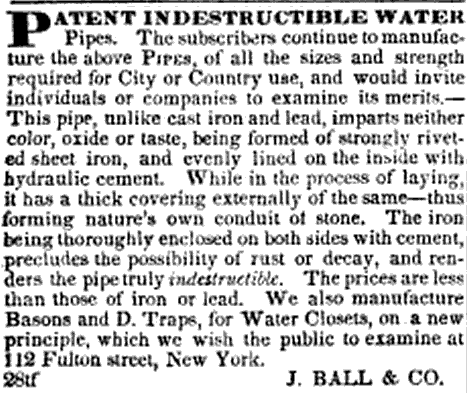 Ball's patent iron and cement pipe. 1903 "D. Goffe Phipps," The New York Times, September 11, 1903, Page 8. New Haven, Sept 10.- D. Goffe Phipps, formerly President of the West Haven Water Company, and a leading Connecticut financier, died as his residence in this city tonight. He was about sixty-five years of age. Cities replacing cement-lined wrought-iron pipe. Plymouth, Mass., has the practically unique distinction of manufacturing all of the pipe that has been used for its water mains. The policy of using exclusively sheet-iron or sheet-steel cement-lined pipes was adopted many years ago (in 1855) and has been followed consistently ever since. In 1900 the town water department built a specially designed plan for making this pipe as a part of its water-works routine. 1916 "Oldest Employe of District Dead," The Washington Times, November 25, 1916, Page 3. George H. Bailey had served in the Engineer Department Since 1878. He was in charge of the Boston water works from 1847 to 1852 and supervised the construction of the first water works. In 1852 he went to Jersey City and supervised there the construction of the water works, remaining in Jersey City in charge of the works until 1860. Later he was employed as a consulting hydraulic engineer by a number of municipalities. 1916 "George H. Bailey Dies at 88," The New York Times, November 26, 1916, Page 21. Mr. Bailey was born in Boston, was in charge of the Boston Water Works from 1847 to 1852, and from that time to 1860 was in charge of the Jersey City Water Works. He planned the erection of the first water works in Newark. Pages 122-124: Cement lined and coated pipes. 70 years experience with cement-lined sheet pipe in many cities suggests cement lining for cast iron. 1935 "Water Pipe Bids Opened," Fitchburg Sentinel (Fitchburg, Massachusetts), August 13, 1935, Page 5. Three companies submitted prices when bids were opened this morning by Joseph M. Peirce, commissioner of public works for water pipe. The bids were requested for purchase of 2000 lineal feet of wrought iron cement lined water pipe, measuring two inches in diameter. The Eureka Pipe Co., Inc and the Cement Lined Pipe Co. both of Lynn, bid $42.49 per 100 feet. The Boston Pipe and Filling Co., Inc submitted a proposal of $47.50 per 100 feet. All three offered 2 per cent discount for payment within 10 days.